Cherry (front) with a cinnamon stain or mahogany (left) with an auburn stain or walnut (rear) with a dark mocha stain; all with a satin finish. 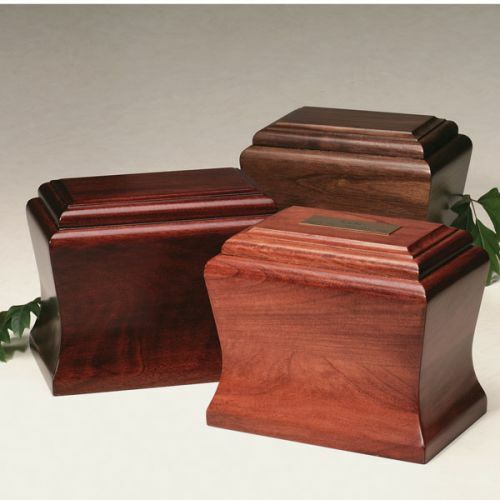 Cherry (front) with a cinnamon stain or mahogany (left) with an auburn stain or walnut (rear) with a dark mocha stain; all with a satin finish. Shown with optional engraved plate #57128-8. Bottom opening panel attaches with screws. 7-1/4"W x 5"D x 6-1/4"H; 95 cu. in.; . Due to the nature of wood, patterns and color will vary.